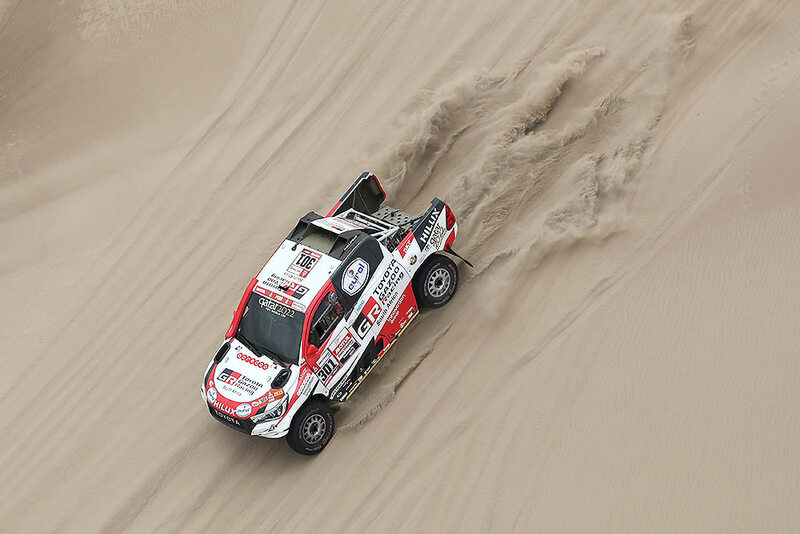 The 41st edition of the Dakar Rally, the world's most challenging off road race, flagged off at the capital city of Peru. 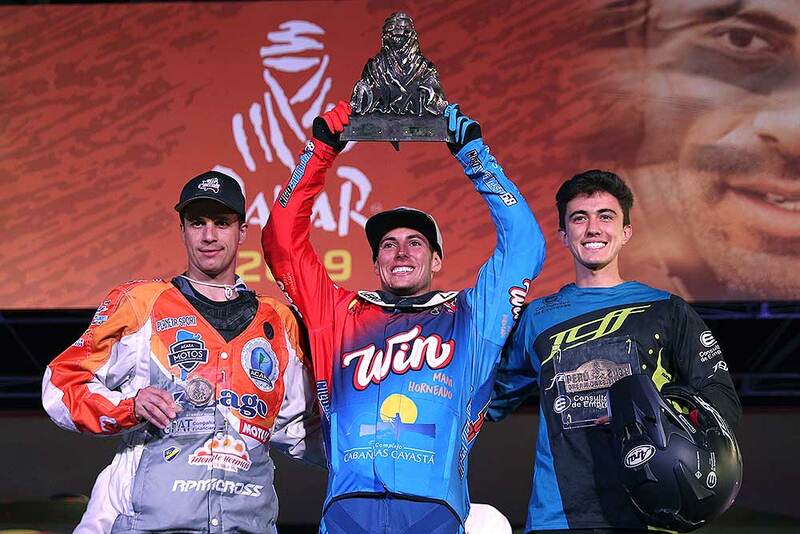 Nicolas Cavigliasso of Argentina who took first on his Yamaha quad, center, Jeremias Gonzalez of Argentina who took second on his Yamaha quad, right, and Gustavo Gallego of Argentina who took third on his Yamaha quad, celebrate at the podium of 2019 Dakar Rally in Lima, Peru. 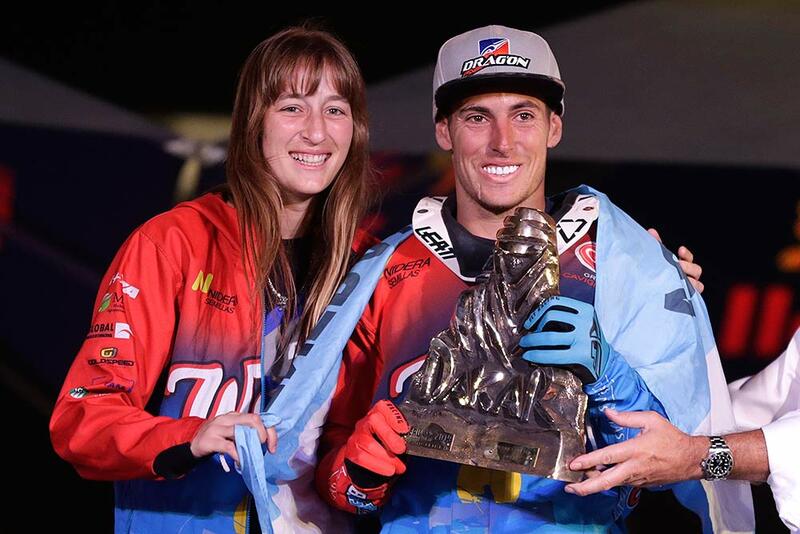 Argentina's quad pilot Nicolas Cavigliasso celebrates with his girlfriend as he holds his 2019 Dakar Rally winner's trophy, in Lima, Peru. 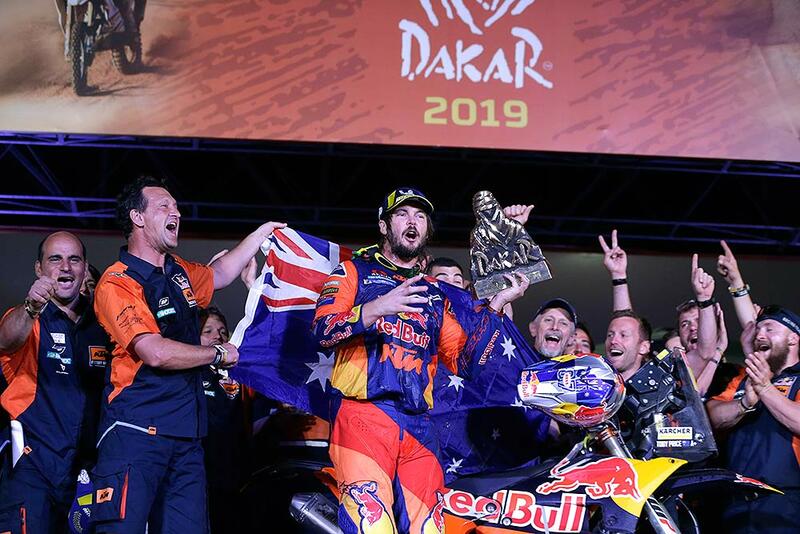 Toby Price of Australia, who took first on his KTM motorbike, celebrates with his team with the 2019 Dakar Rally winner's trophy in Lima, Peru. 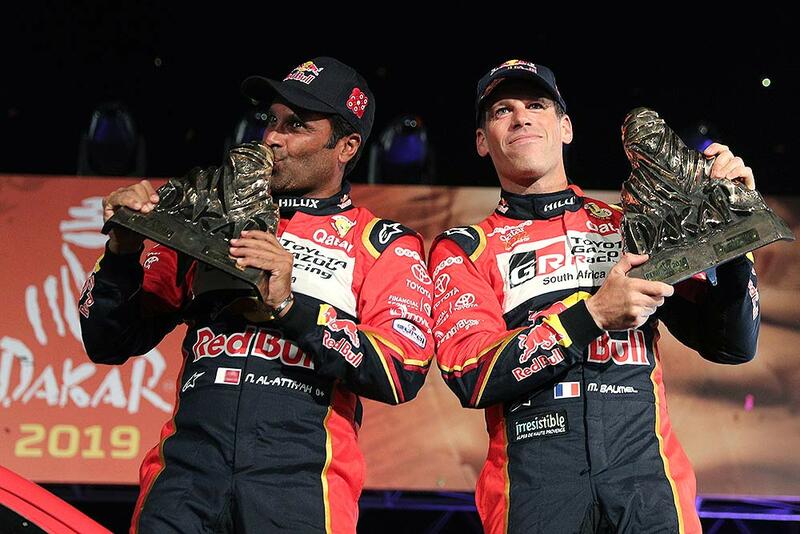 Driver Nasser Al-Attiyah, of Qatar, left, and co-driver Matthieu Baumel, of France, celebrate during 2019 Dakar Rally podium in Lima, Peru. 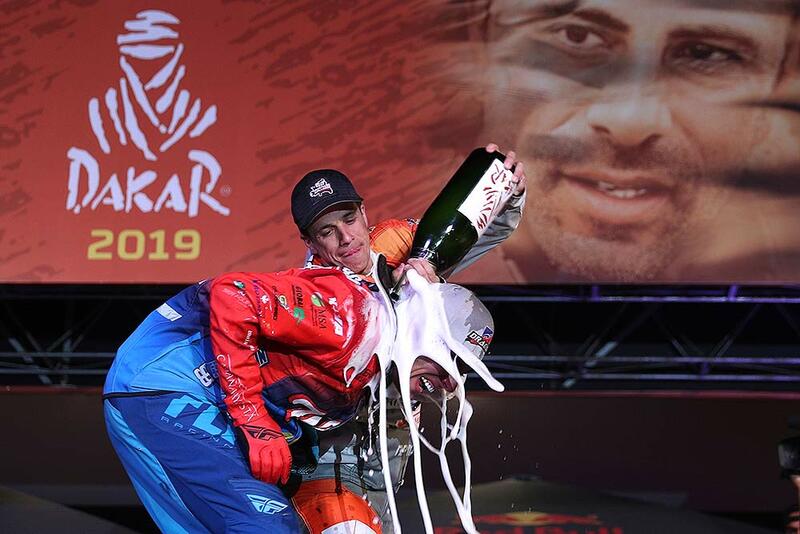 Argentina's quad pilot Gustavo Gallego dumps sparkling wine over Nicolas Cavigliasso, winner of the quads race, during the podium of the 2019 Dakar Rally, in Lima, Peru. 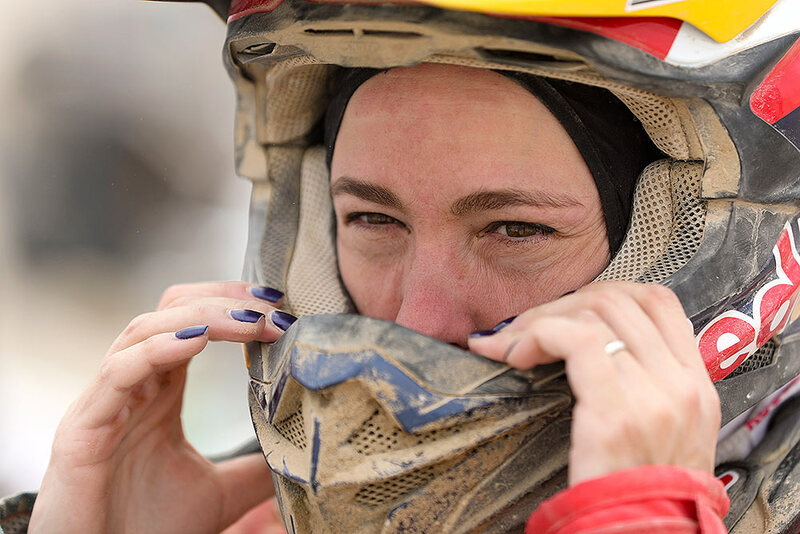 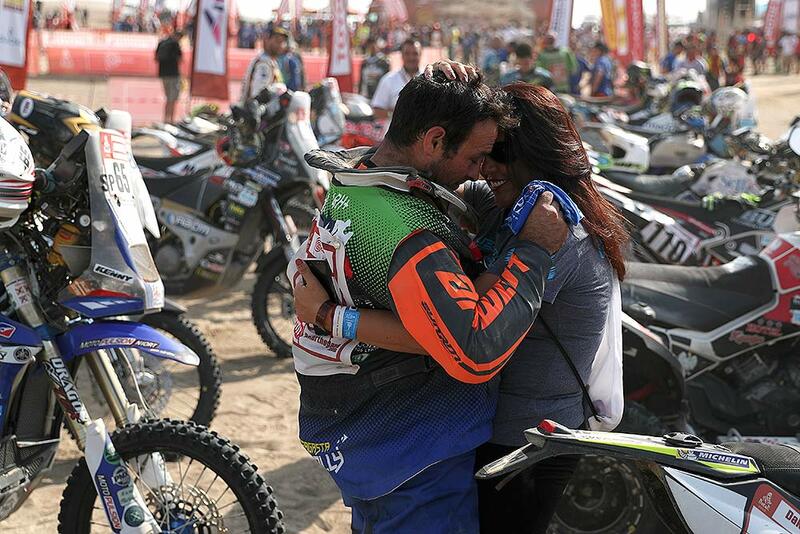 Chile's Yamaha quad rider Luis Barahona is embraced by his wife after placing 7th at the end of the Dakar Rally in Pisco, Peru. 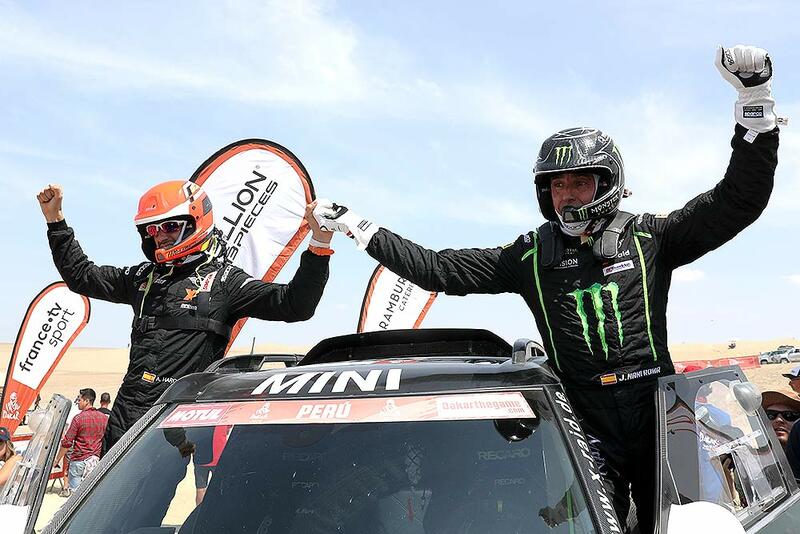 Driver Nani Roma of Spain, right, and co-driver Alex Haro of Spain celebrate on their Mini taking second place at the arrival of the last stage of the Dakar Rally in Pisco, Peru. 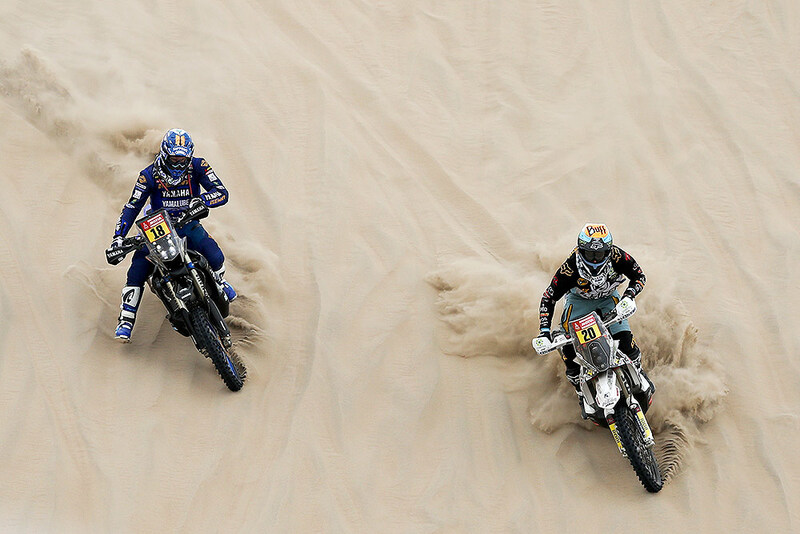 Nicolas Cavigliasso of Argentina who took first on his Yamaha quad, right, Jeremias Gonzalez of Argentina who took second on his Yamaha quad, left, and Gustavo Gallego of Argentina who took third on his Yamaha quad celebrates after their arrival in the last stage of the Dakar Rally in Pisco, Peru. 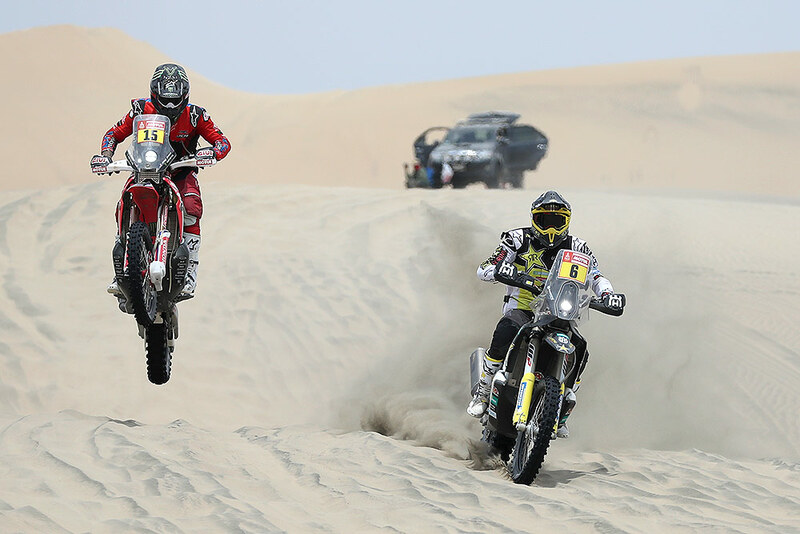 From left to right, Pablo Quintanilla of Chile, Xavier De Soultrait of France, Adrien Van Beveren of France and Luciano Benavides of Argentina ride their motorbikes during the stage nine of the Dakar Rally in Pisco, Peru. 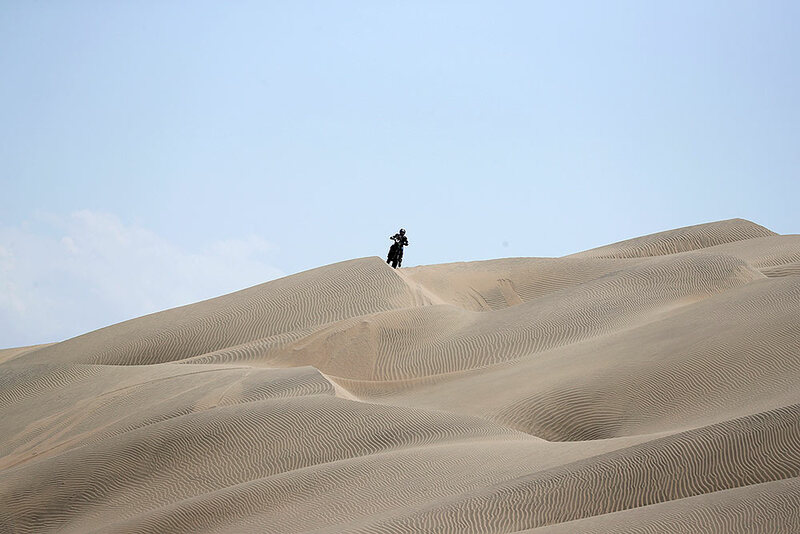 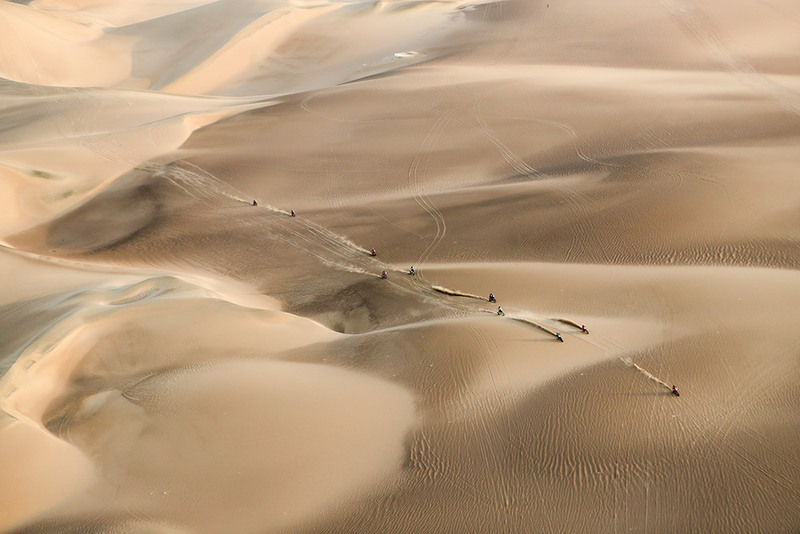 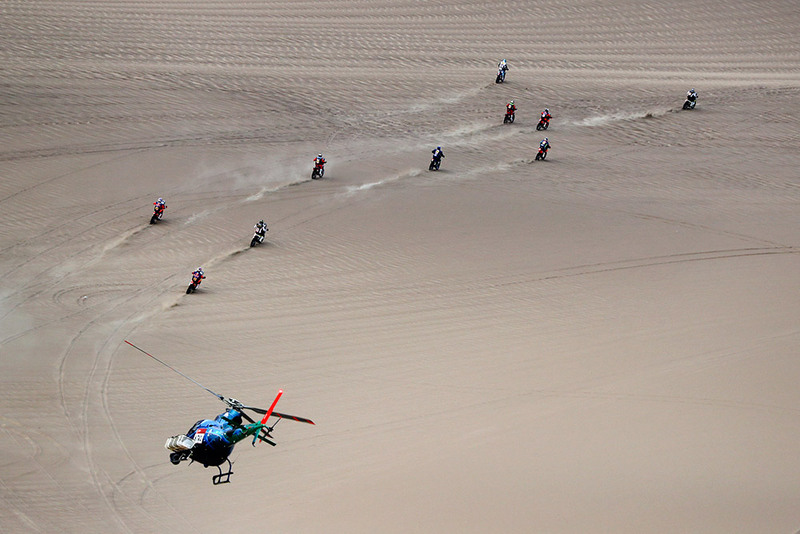 Competitors ride their motorbike across the dunes during stage nine of the Dakar Rally in Pisco, Peru. 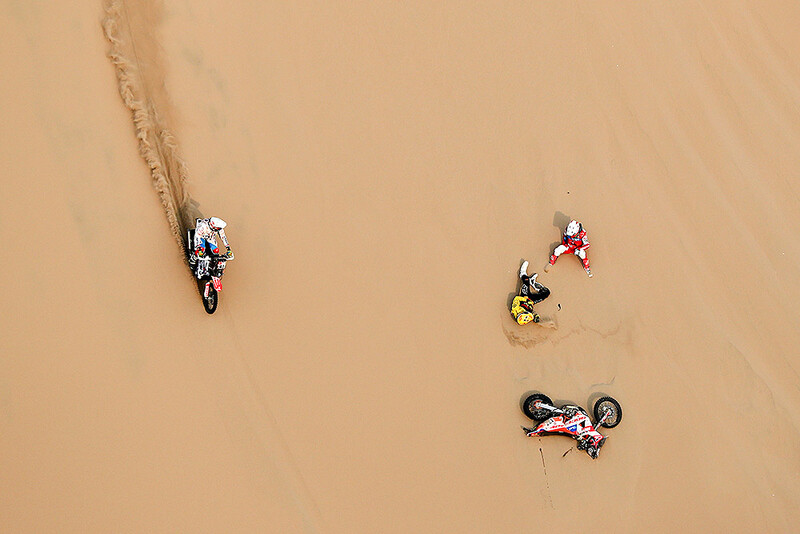 Competitors ride their motorbikes during the stage nine of the Dakar Rally in Pisco, Peru. 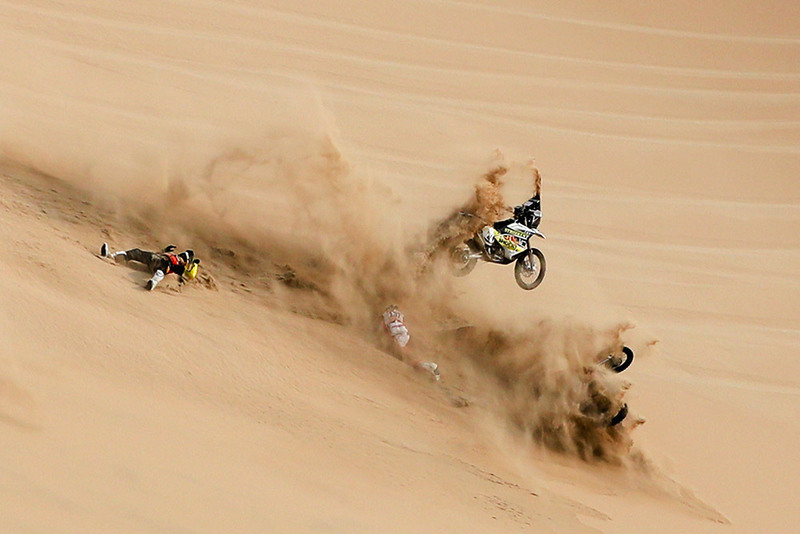 Husqvarna motorbike rider Jan Brabec of Czech Republic left, and KTM rider Cesar Pardo of Peru fall during the stage nine of the Dakar Rally in Pisco, Peru. 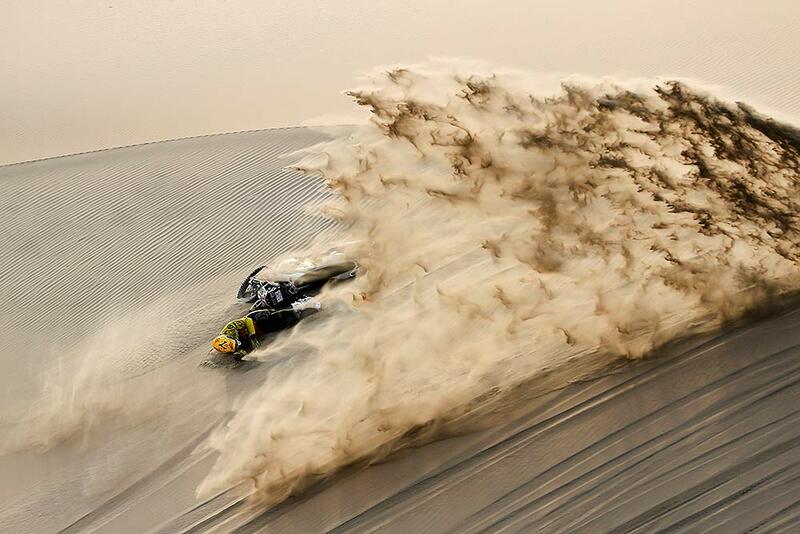 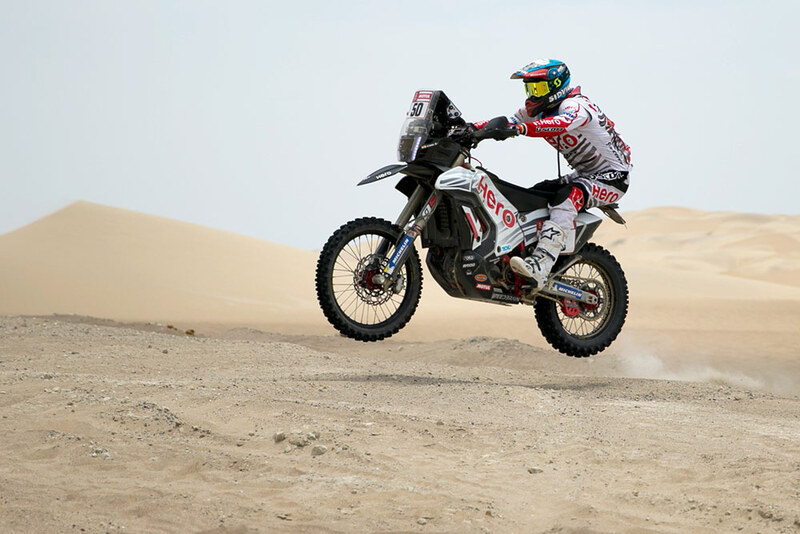 Jan Brabec of Czech Republic falls from his Husqvarna motorbike during the stage nine of the Dakar Rally in Pisco, Peru. 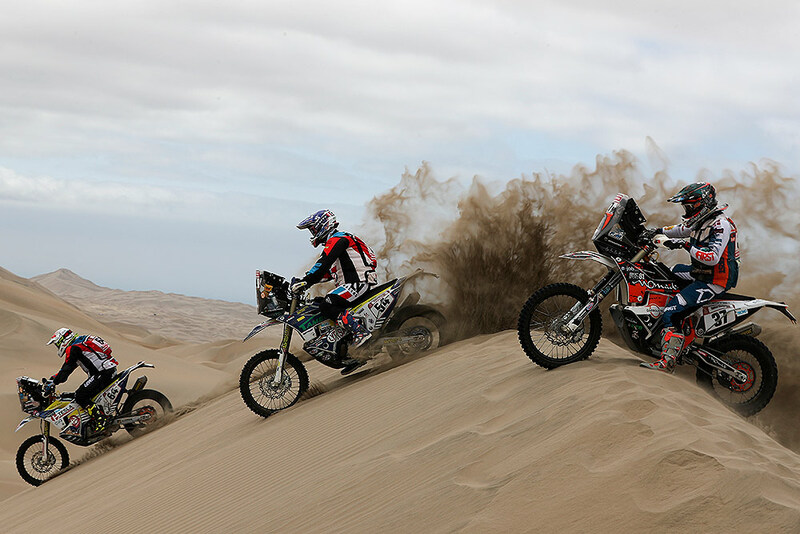 Adam Tomiczek, of Poland, rides his KTM motorbike past Husqvarna motorbike rider Jan Brabec, of Czech Republic, and KTM rider Cesar Pardo, of Peru, right top, after they fell during stage nine of the Dakar Rally in Pisco, Peru. 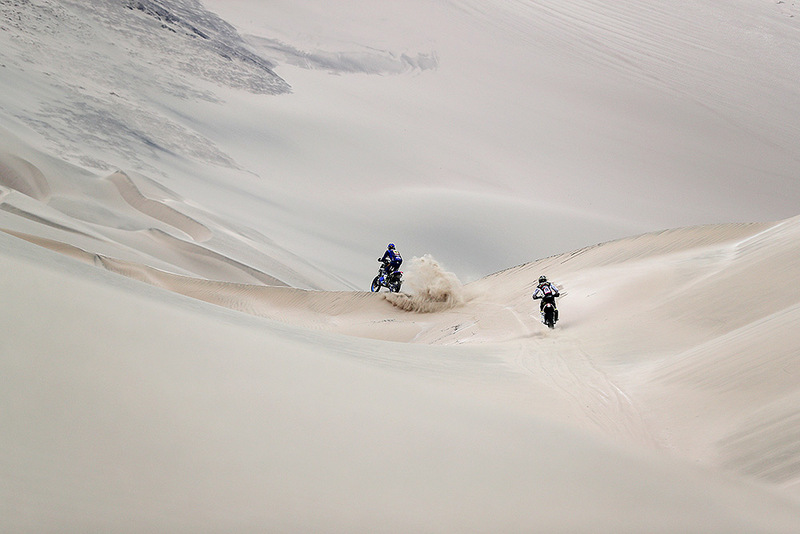 Oriol Mena of Spain, left, rides his Hero motorbike and Maurizio Gerini of Italy rides his Husqvarna motorbike during the stage nine of the Dakar Rally in Pisco, Peru. 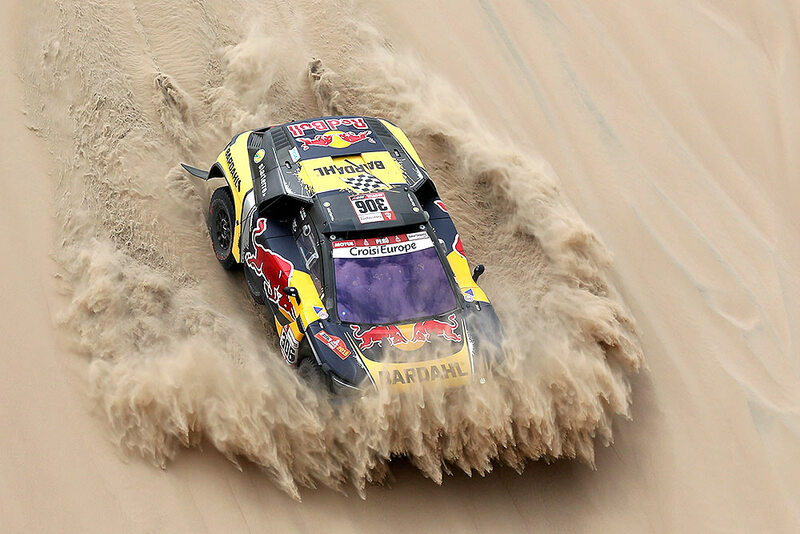 Driver Sebastien Loeb, of France, and co-driver Daniel Elena, of Monaco, race their Peugeot during the stage nine of the Dakar Rally in Pisco, Peru. 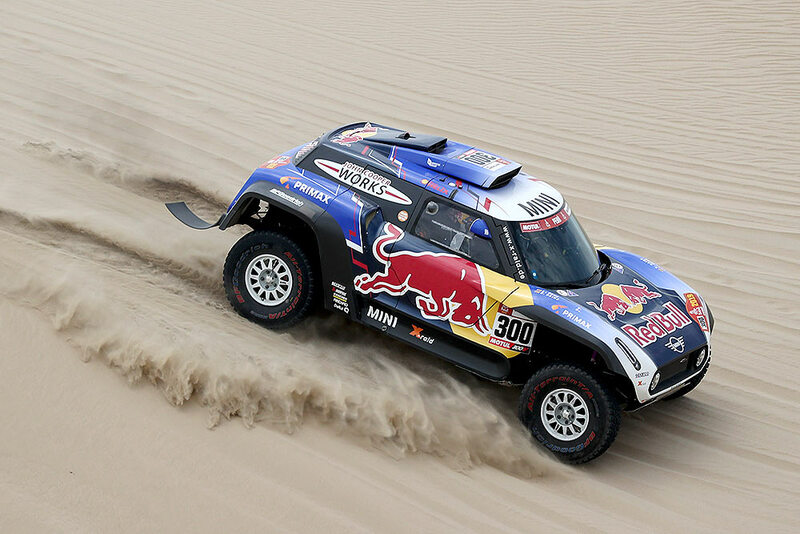 Driver Stephane Peterhansel, of France, and co-driver David Castera, of France, race their Mini during the stage nine of the Dakar Rally in Pisco, Peru. 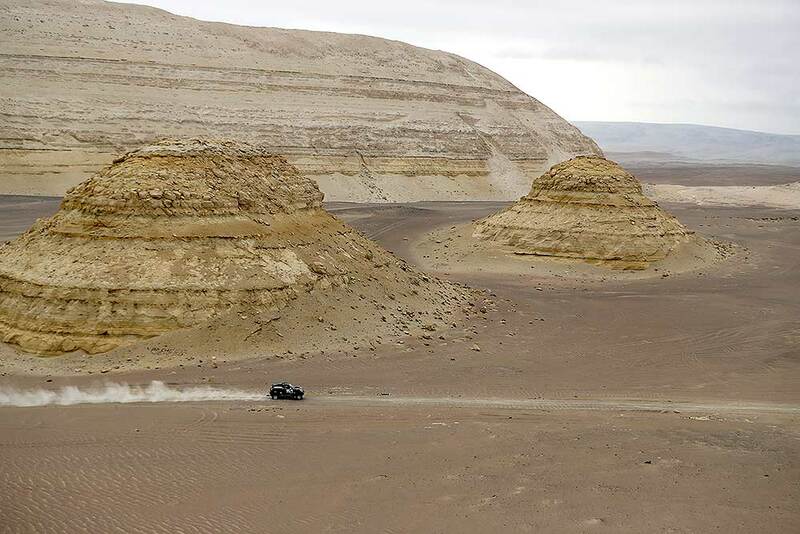 Driver Stephane Peterhansel, of France, and co-driver David Castera, of France, race their Mini during the stage eight of the Dakar Rally between San Juan de Marcona and Pisco, Peru. 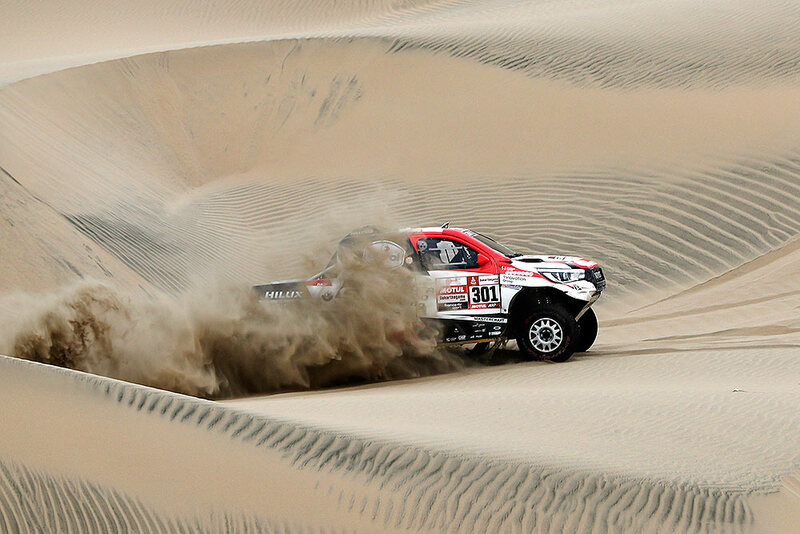 Driver Nasser Al-Attiyah, of Qatar, and co-driver Matthieu Baumel, of France, race their Toyota during the stage eight of the Dakar Rally between San Juan de Marcona and Pisco, Peru. 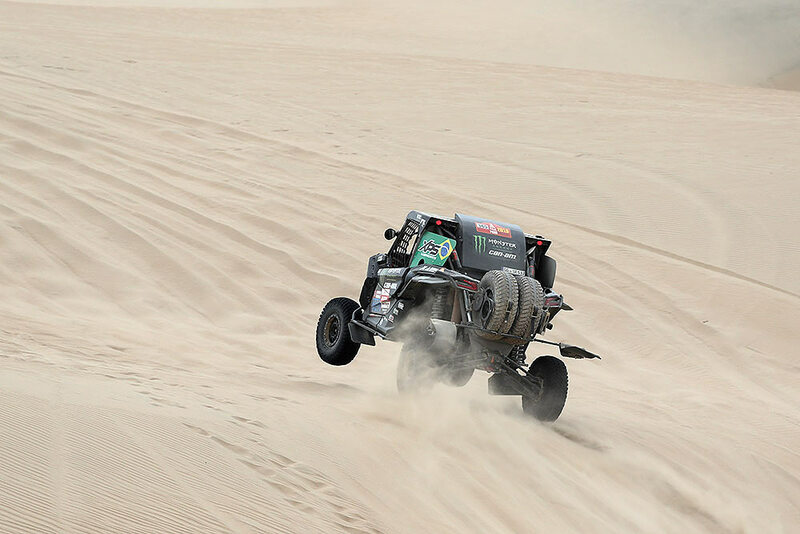 Driver Nani Roma, of Spain, and co-driver Alex Haro, of Spain, race their Mini during the stage eight of the Dakar Rally between San Juan de Marcona and Pisco, Peru. 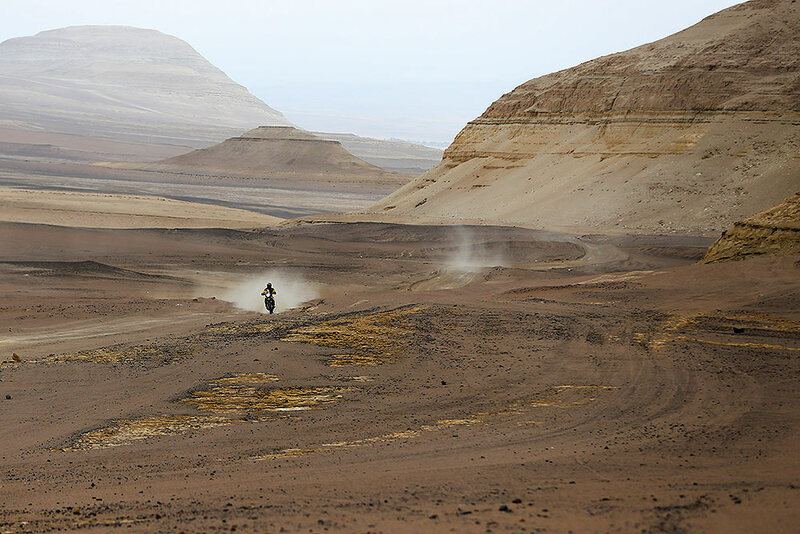 Stefan Svitko of Slovakia rides his KTM motorbike during the stage eight of the Dakar Rally between San Juan de Marcona and Pisco, Peru. 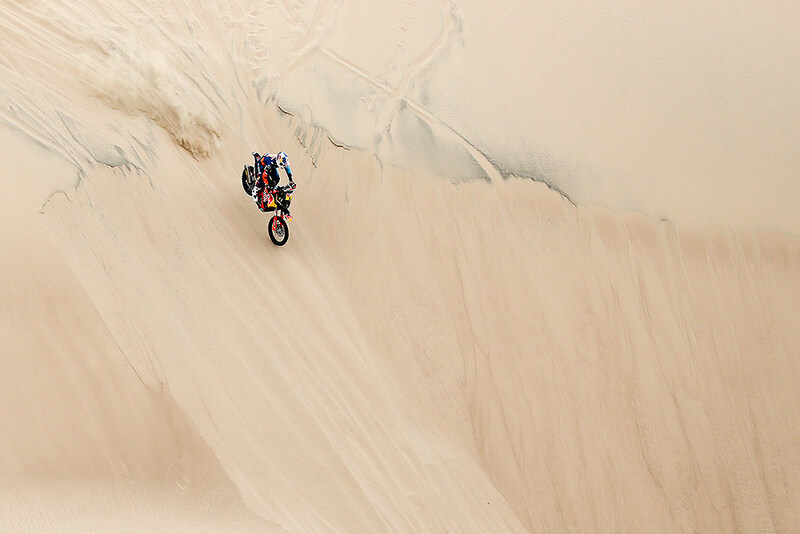 Matthias Walkner of Austria rides his KTM motorbike during the stage eight of the Dakar Rally between San Juan de Marcona and Pisco, Peru. 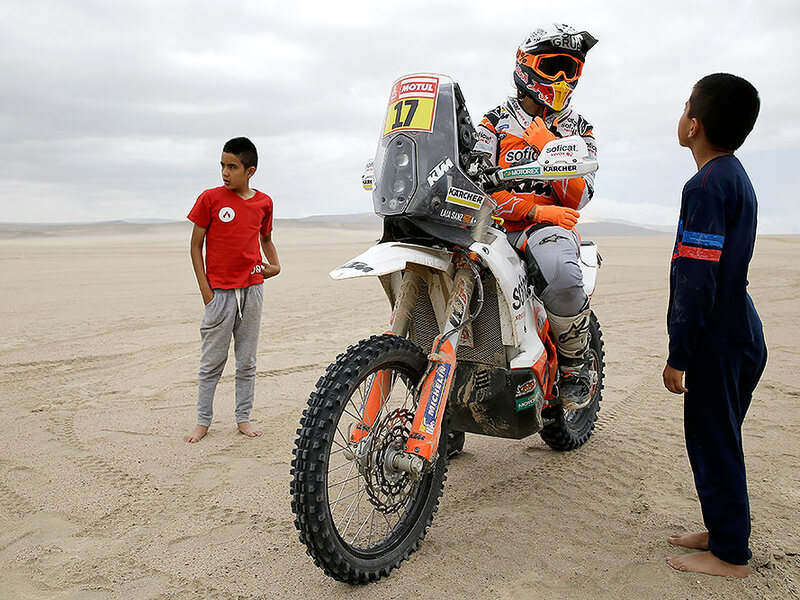 A boy looks at Laia Sanz of Spain as she sits on her KTM motorbike at a neutralization stop during the stage eight of the Dakar Rally between San Juan de Marcona and Pisco, Peru. 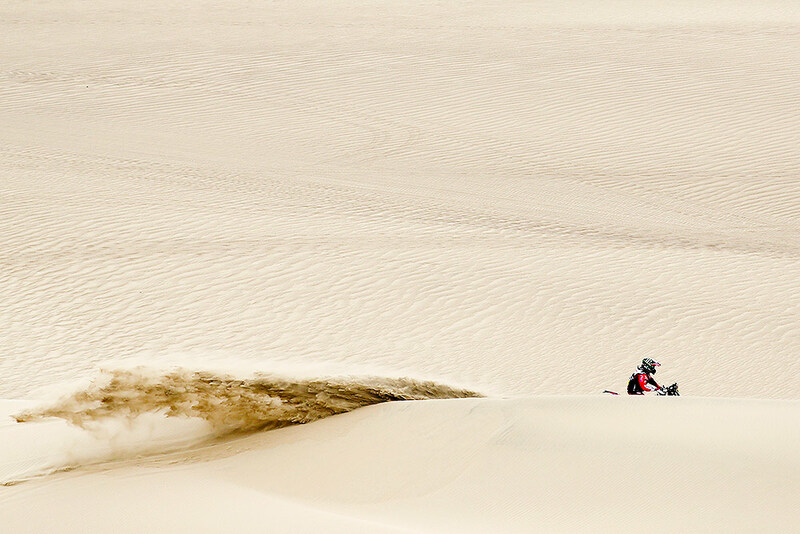 Anastasiya Nifontova of Russia stops to refuel her Husqvarna motorbike during the stage eight of the Dakar Rally between San Juan de Marcona and Pisco, Peru. 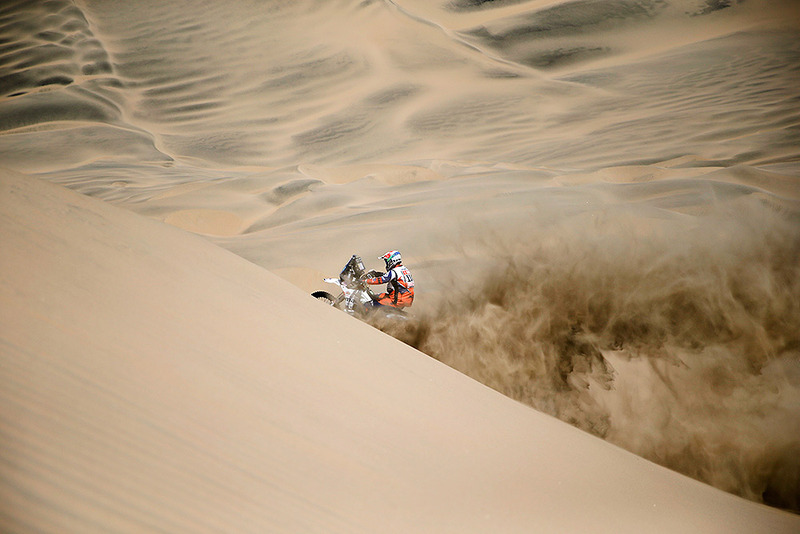 Ross Branch of Botswana rides his KTM motorbike during the stage seven of the Dakar Rally in San Juan de Marcona, Peru. 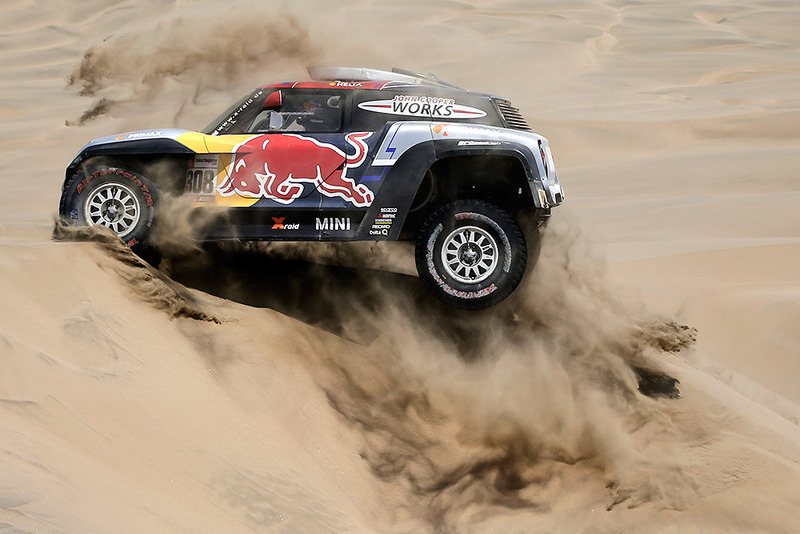 Driver Cyril Despres, of France, and co-driver Jean-Paul Cottret, of France, race their Mini during the stage seven of the Dakar Rally in San Juan de Marcona, Peru. 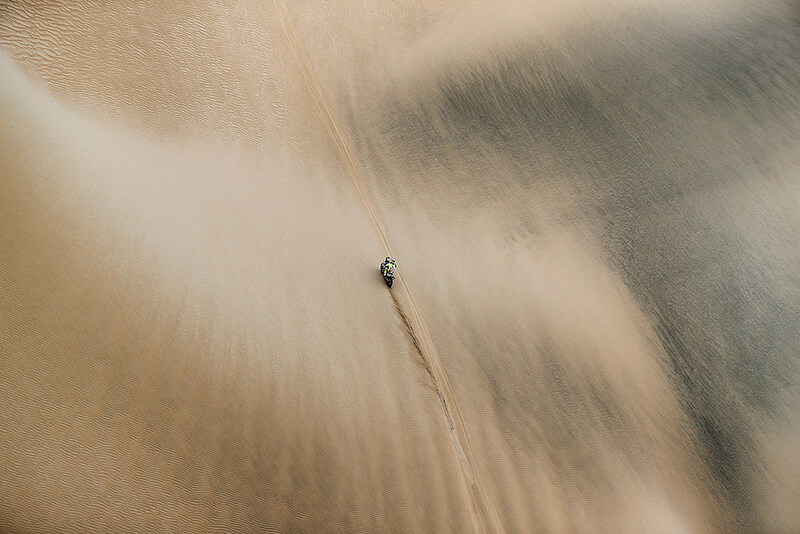 Arunas Gelazninkas of Lithuania rides his KTM motorbike during the stage seven of the Dakar Rally in San Juan de Marcona, Peru. 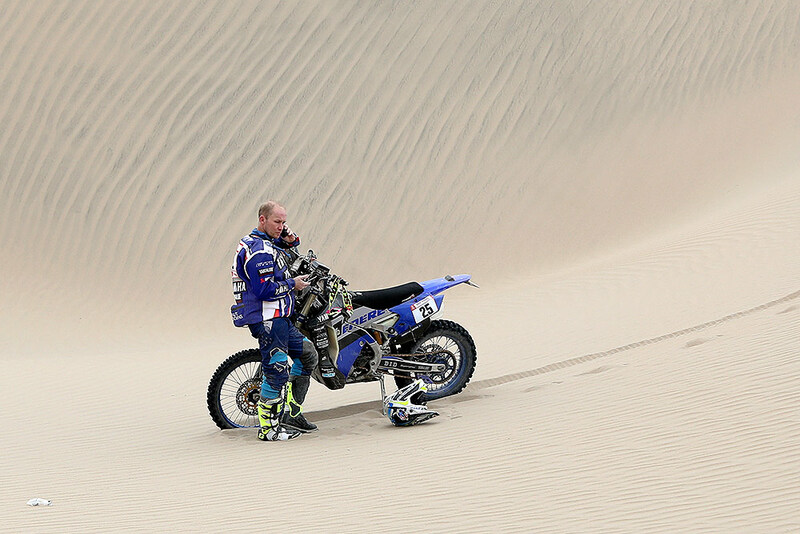 Xavier De Soultrait of France rides his Yamaha motorbike across the dunes during stage seven of the Dakar Rally in San Juan de Marcona, Peru. 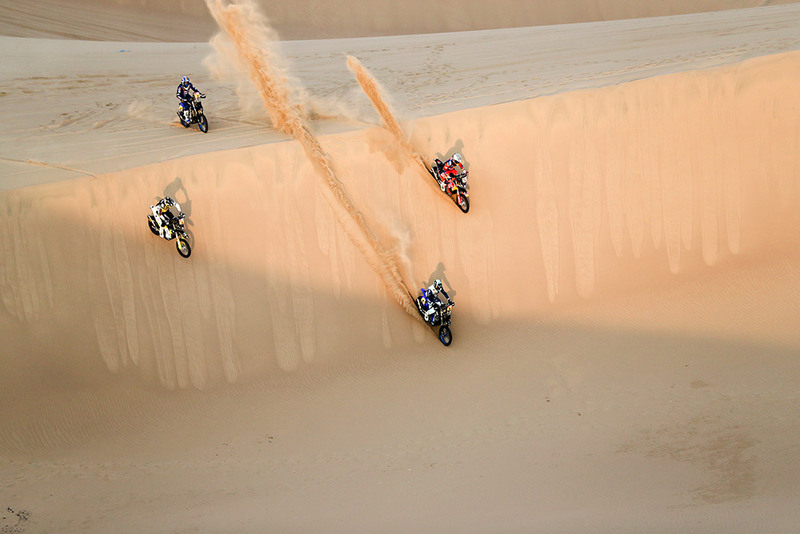 From left, KTM rider Oscar Romero Montoya of Spain, Husqvarna rider Fausto Mota of Spain and KTM rider Loic Minaudier of France race their motorbikes during stage six of the Dakar Rally between Arequipa and San Juan de Marcona, Peru. 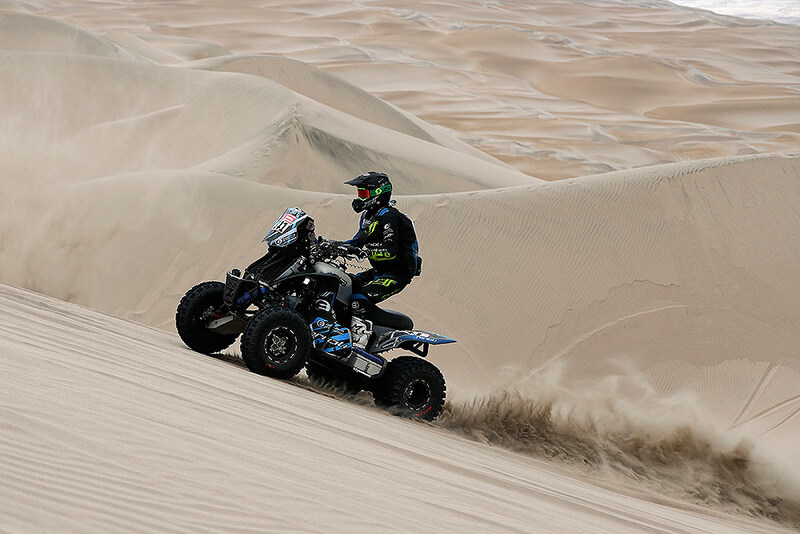 Jeremias Gonzalez of Argentina rides his Yamaha quad during the stage six of the Dakar Rally between Arequipa and San Juan de Marcona, Peru. 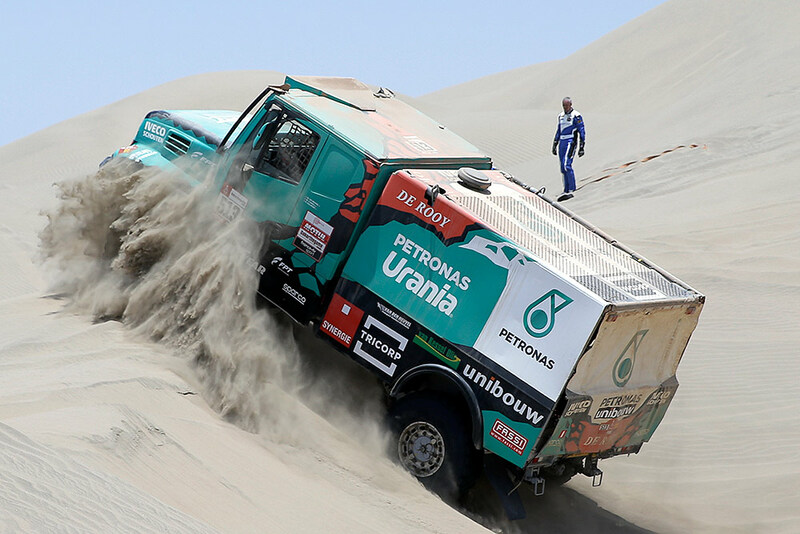 Driver Gerard De Rooy, of Netherlands, and co-drivers Darek Rodewald, of Poland, and Moises Torrallardona, of Spain, race their Iveco truck during the stage six of the Dakar Rally between Arequipa and San Juan de Marcona, Peru. 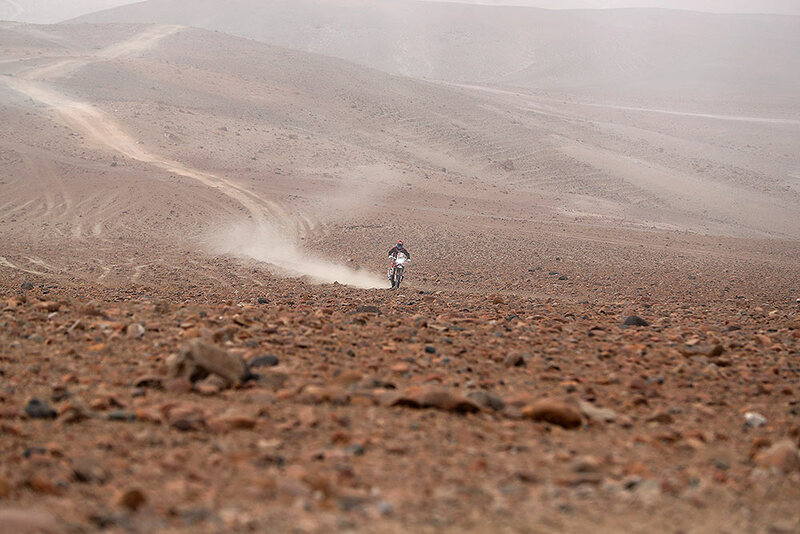 Laia Sanz of Spain rides her KTM motorbike during stage six of the Dakar Rally between Arequipa and San Juan de Marcona, Peru. 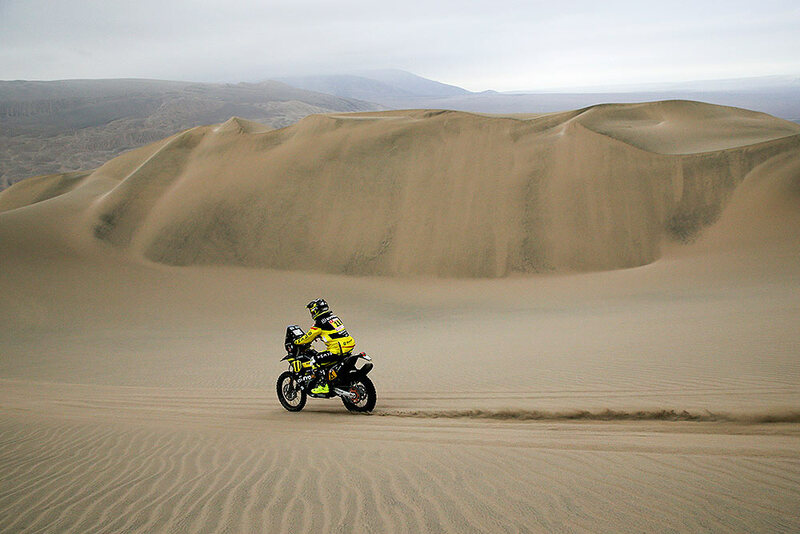 Lorenzo Santolino of Spain rides his Sherco TVS motorbike during stage six of the Dakar Rally between Arequipa and San Juan de Marcona, Peru. 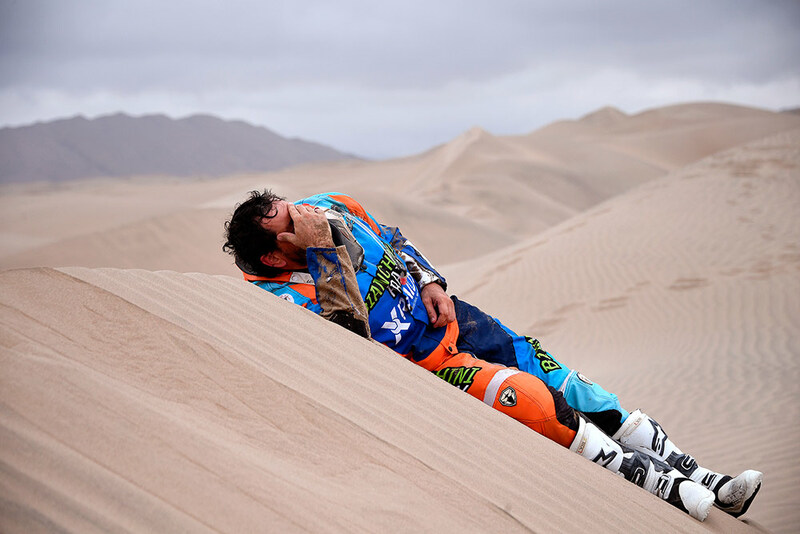 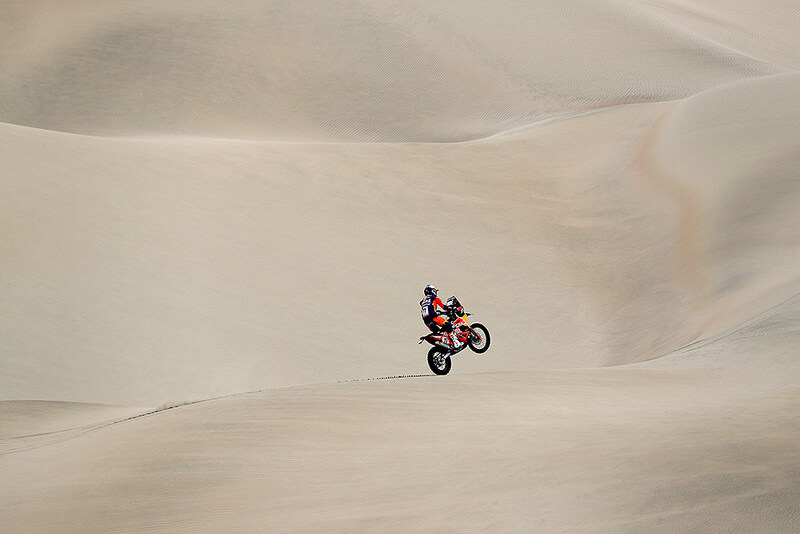 Luciano Benavides of Argentina rides his KTM motorbike during stage six of the Dakar Rally between Arequipa and San Juan de Marcona, Peru. 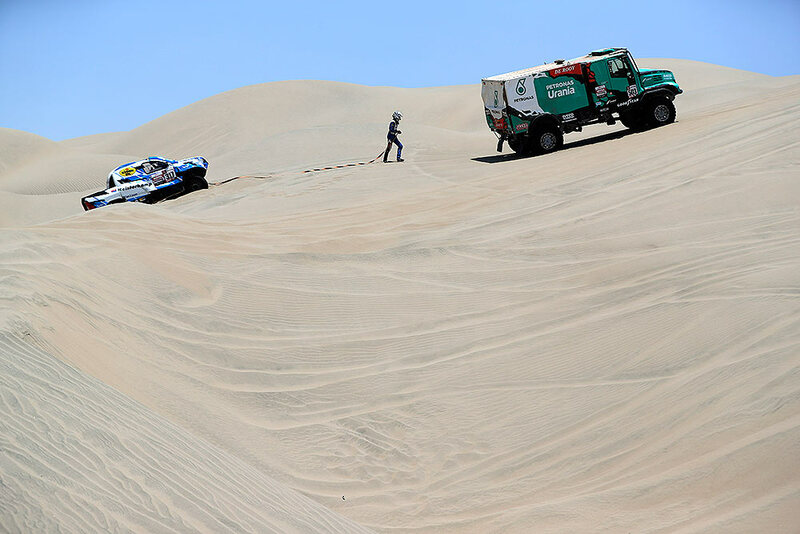 Co-driver Harmen Scholtalbers, of Netherlands, walks to hook his stuck Toyota to the Iveco truck of driver Gerard De Rooy, of Netherlands, and co-drivers Darek Rodewald, of Poland, and Moises Torrallardona, of Spain, during the stage six of the Dakar Rally between Arequipa and San Juan de Marcona, Peru. 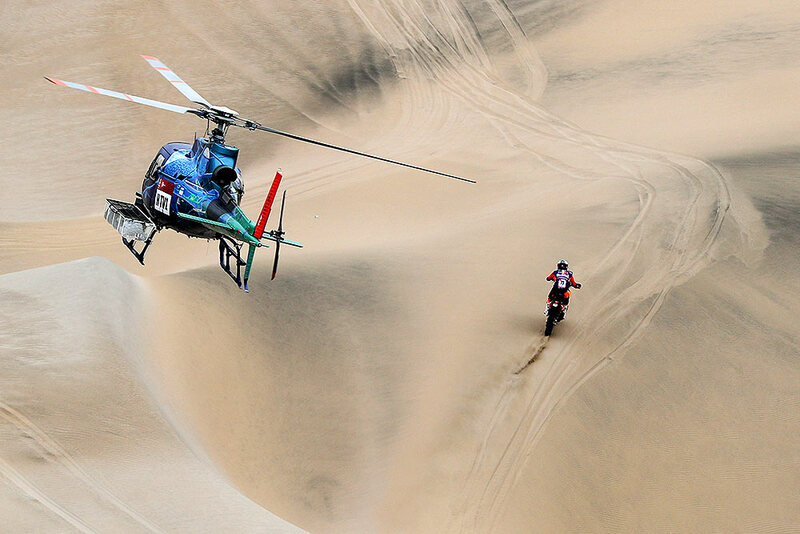 Luciano Benavides of Argentina rides his KTM motorbike followed by a TV helicopter during stage six of the Dakar Rally between Arequipa and San Juan de Marcona, Peru. 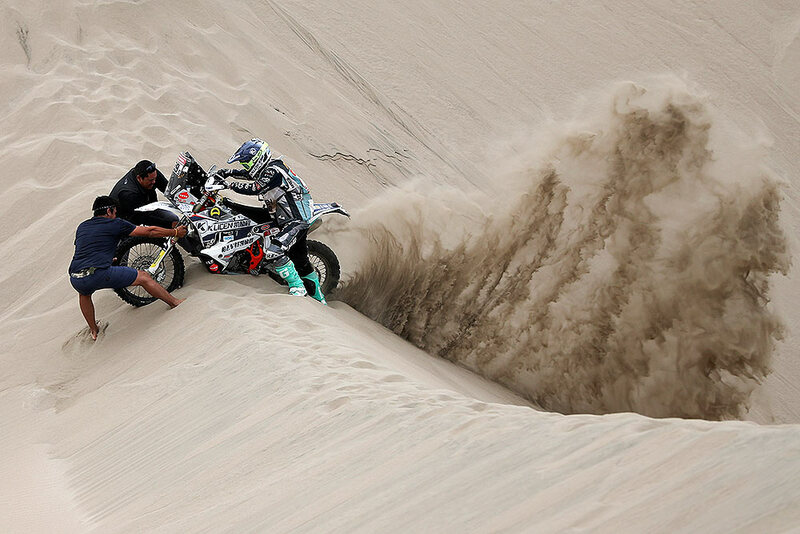 Spectators help pull the KTM motorbike of Zhang Min of China during the stage six of the Dakar Rally between Arequipa and San Juan de Marcona, Peru. 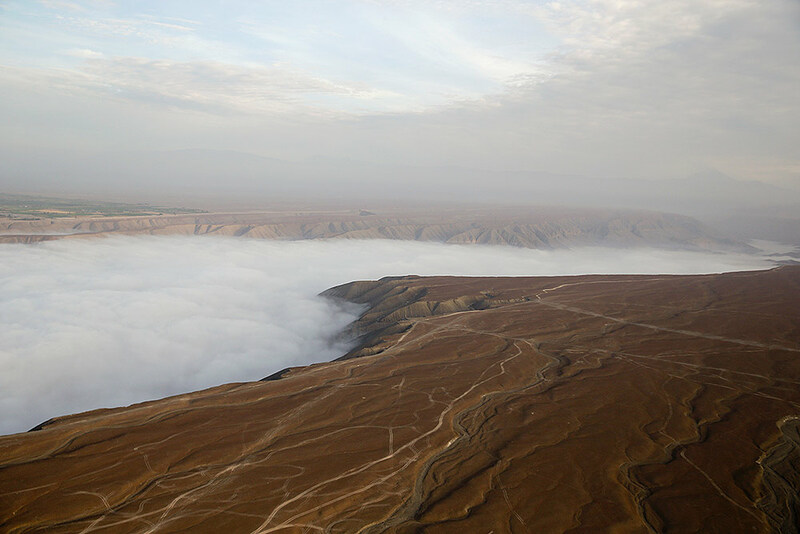 A valley is covered by clouds prior to the start of the stage six of the Dakar Rally between Arequipa and San Juan de Marcona, Peru. 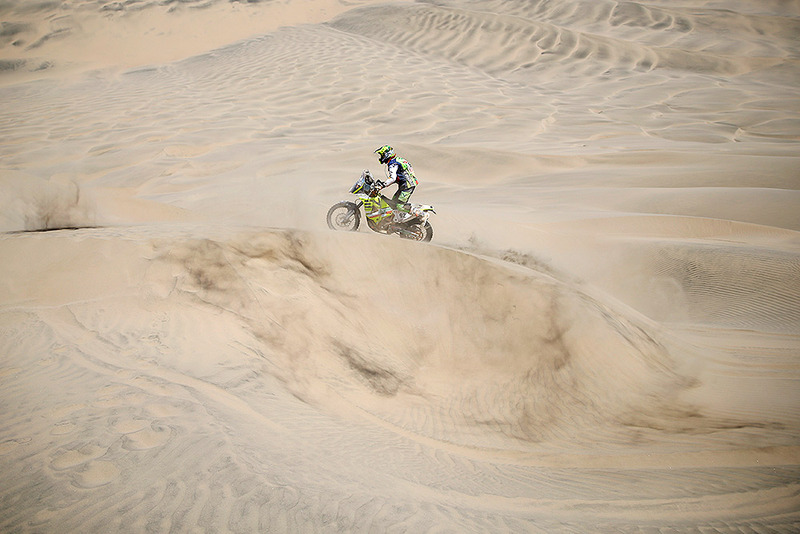 Santosh Shivashankar Chunchunguppe of India rides his Hero motorbike during the second stage of the Dakar Rally between Pisco and San Juan de Marcona, Peru. 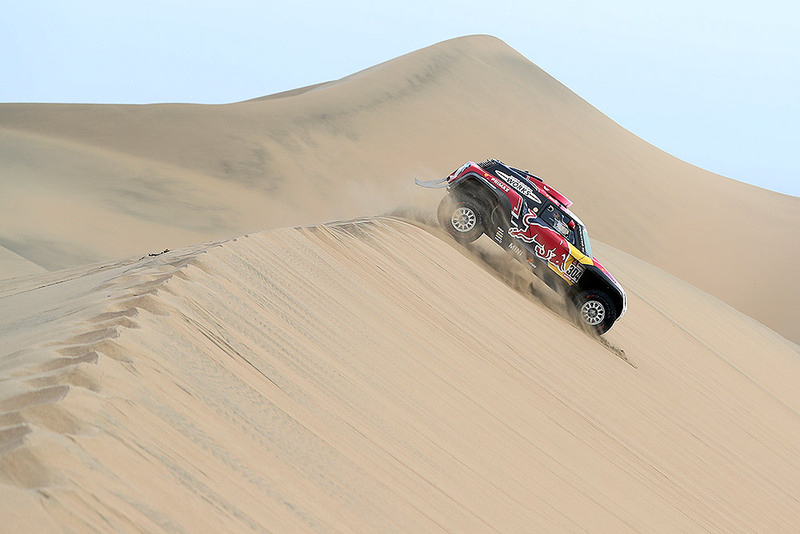 Driver Carlos Sainz and co-driver Lucas Cruz, both from Spain, race their Mini across the dunes during the second stage of the Dakar Rally between Pisco and San Juan de Marcona, Peru. 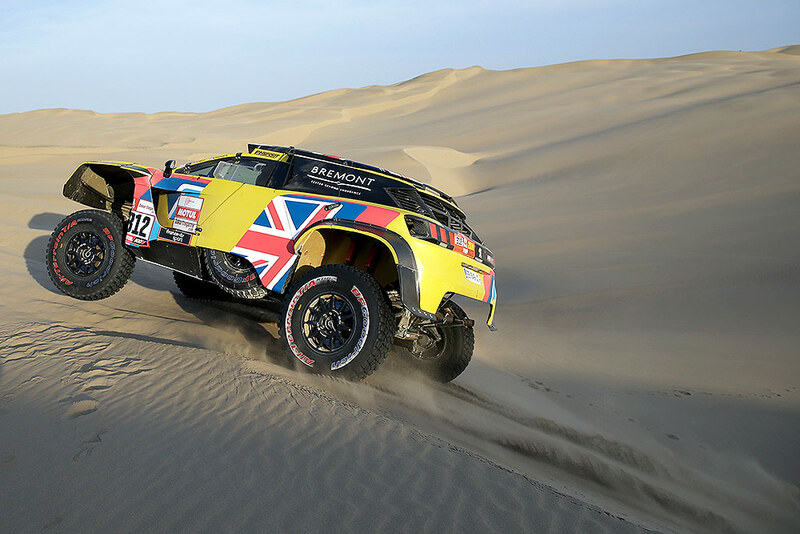 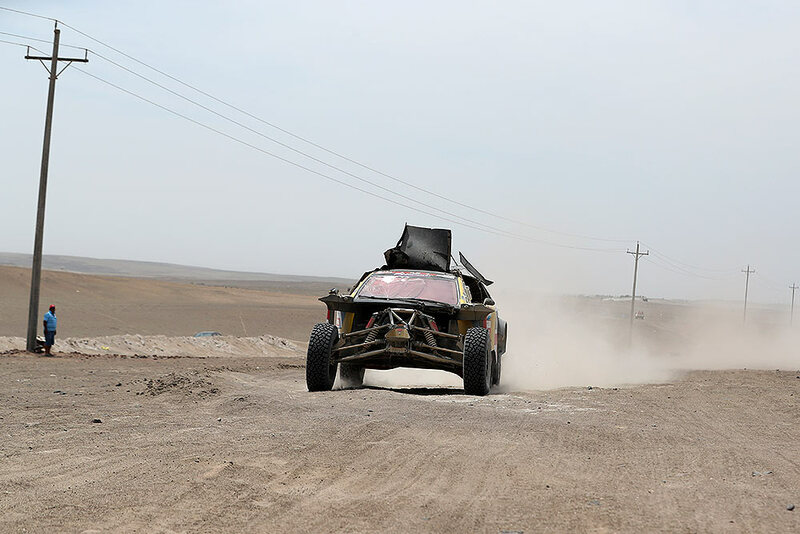 Driver Harry Hunt, of Great Britain, and co-driver Wouter Rosegaar, of Netherlands, race their Peugeot during the second stage of the Dakar Rally between Pisco and San Juan de Marcona, Peru. 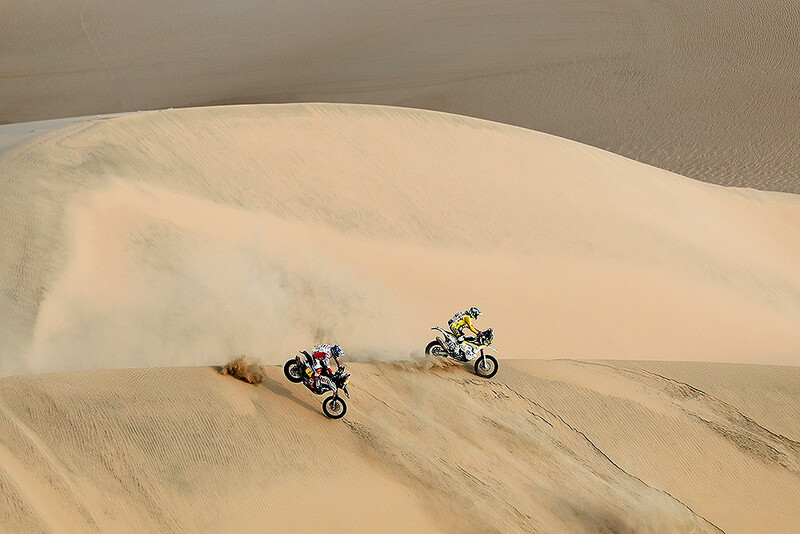 Ricky Brabec of United States, left, rides his Honda motorbike and Pablo Quintanilla of Chile rides his Husqvarna during the second stage of the Dakar Rally across the dunes between Pisco and San Juan de Marcona, Peru. 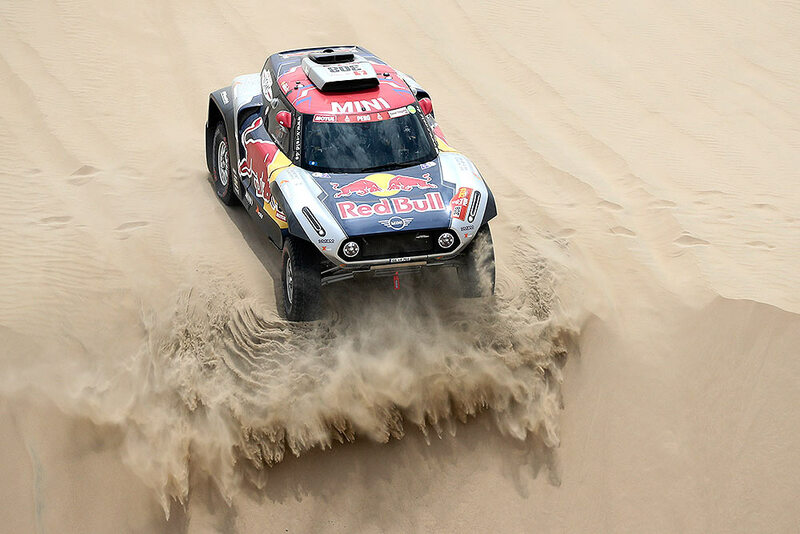 Driver Cyril Despres, of France, and co-driver Jean-Paul Cottret, of France, race their Mini during the second stage of the Dakar Rally between Pisco and San Juan de Marcona, Peru. 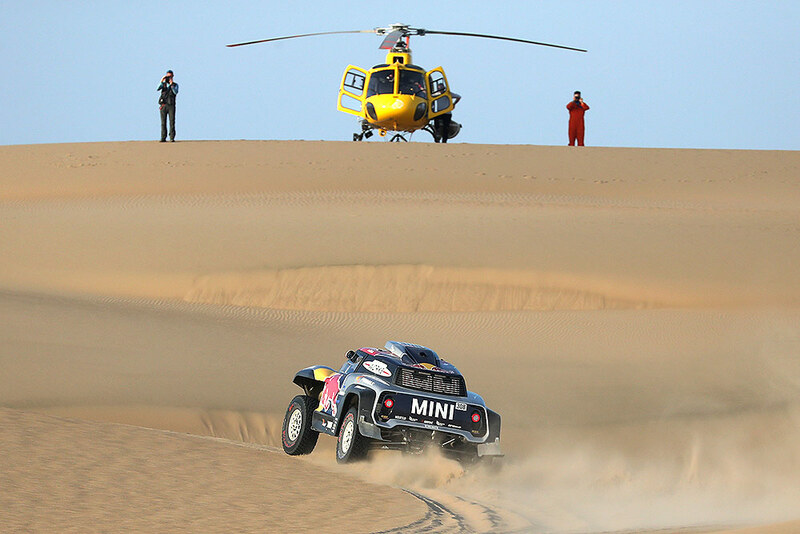 Driver Stephane Peterhansel, of France, and co-driver David Castera, of France, race their Mini during the second stage of the Dakar Rally between Pisco and San Juan de Marcona, Peru. 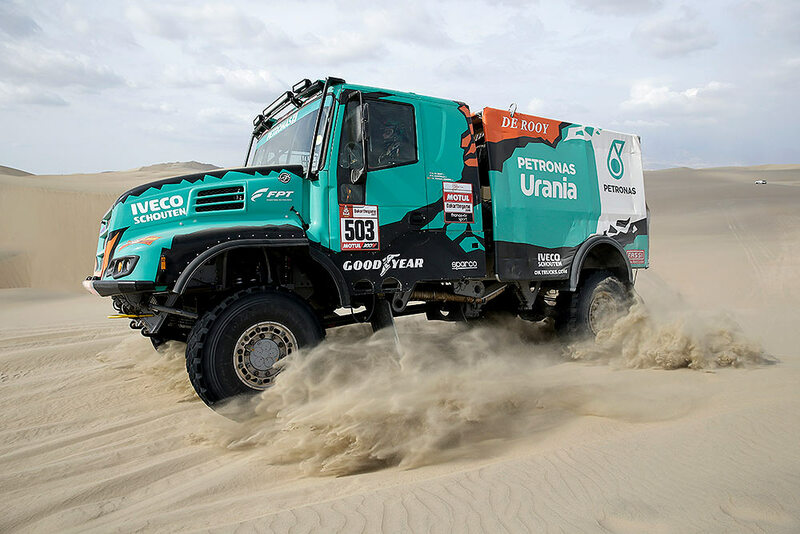 Driver Gerard De Rooy, of Netherlands, and co-drivers Darek Rodewald, of Poland, and Moises Torrallardona, of Spain, race their Iveco truck during the first stage of the Dakar Rally between Lima and Pisco, Peru. 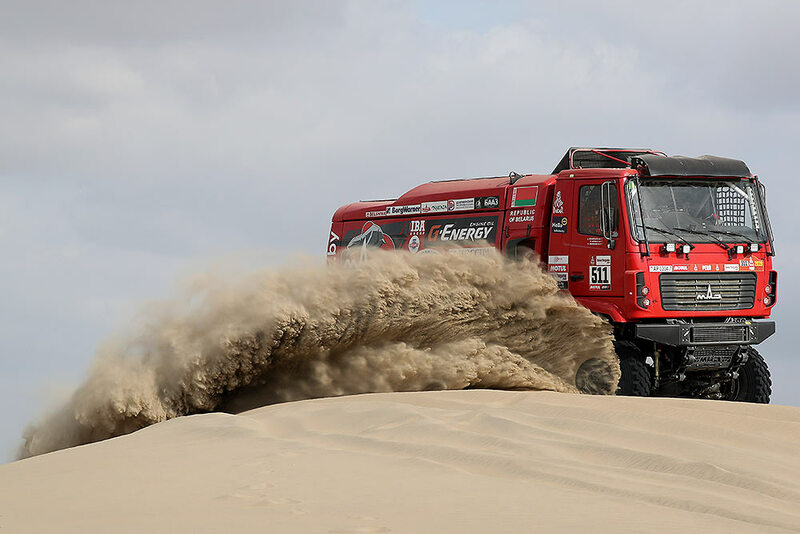 Driver Aliaksei Vishneuski and co-drivers Maksim Novikau and Andrei Neviarovich, all of Belarus, race their Maz truck during the first stage of the Dakar Rally between Lima and Pisco, Peru. 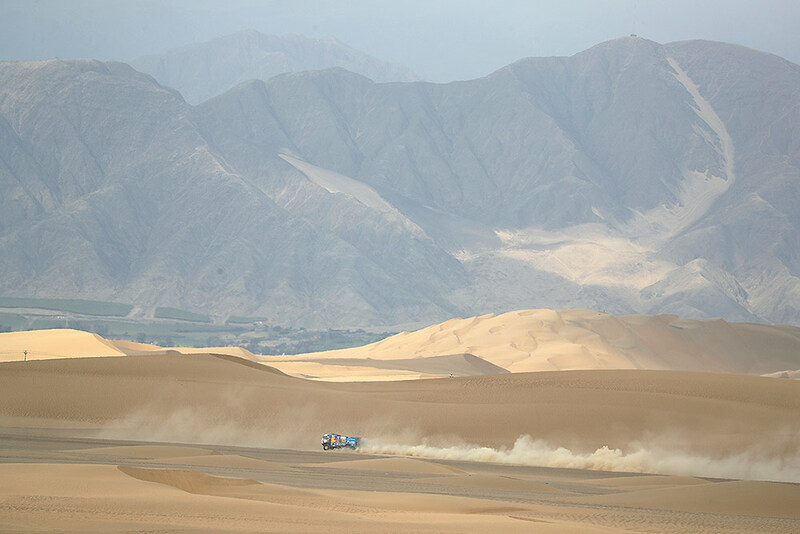 Driver Airat Mardeev, of Russia, and co-drivers Dmitriy Svistunov, of Russia, and Akhmet Galiautdinov, of Russia, race their Kamaz truck during the first stage of the Dakar Rally between Lima and Pisco, Peru. 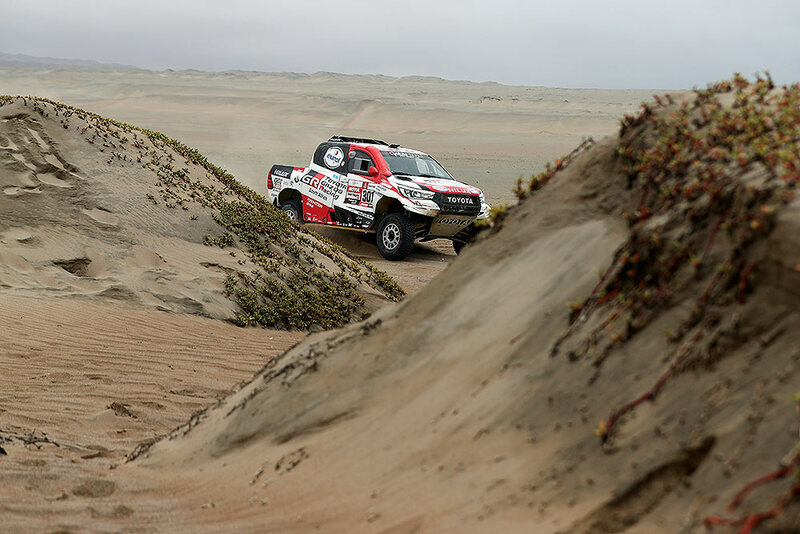 Driver Nasser Al-Attiyah, of Qatar, and co-driver Matthieu Baumel, of France, race their Toyota during the first stage of the Dakar Rally between Lima and Pisco, Peru. 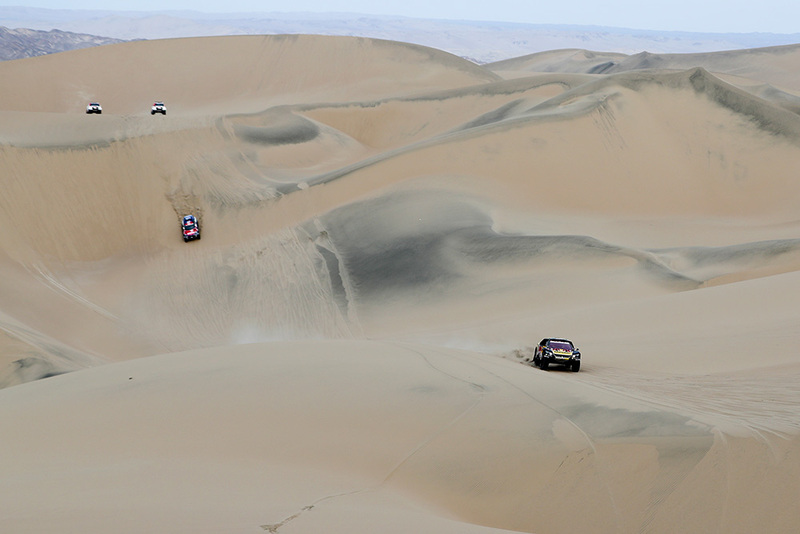 Driver Sebastien Loeb, of France, and co-driver Daniel Elena, of Monaco, race their Peugeot during the first stage of the Dakar Rally between Lima and Pisco, Peru. 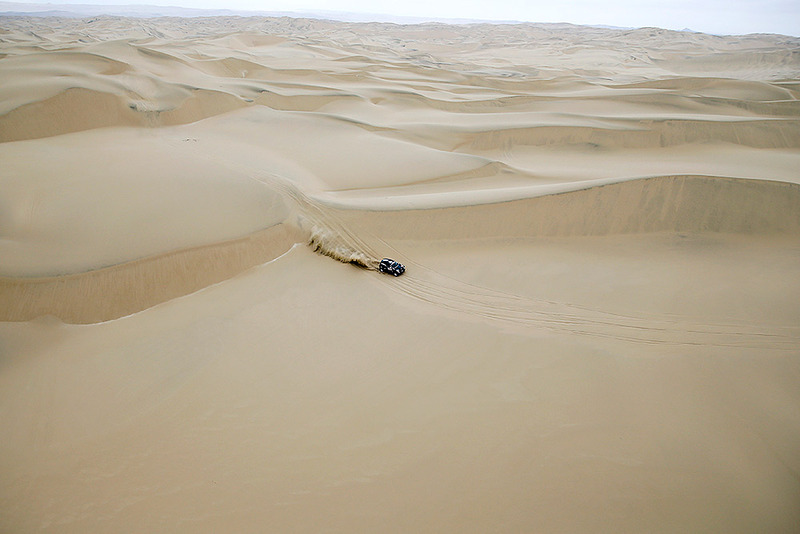 Driver Cyril Despres, of France, and co-driver Jean-Paul Cottret, of France, race their Mini during the first stage of the Dakar Rally between Lima and Pisco, Peru. 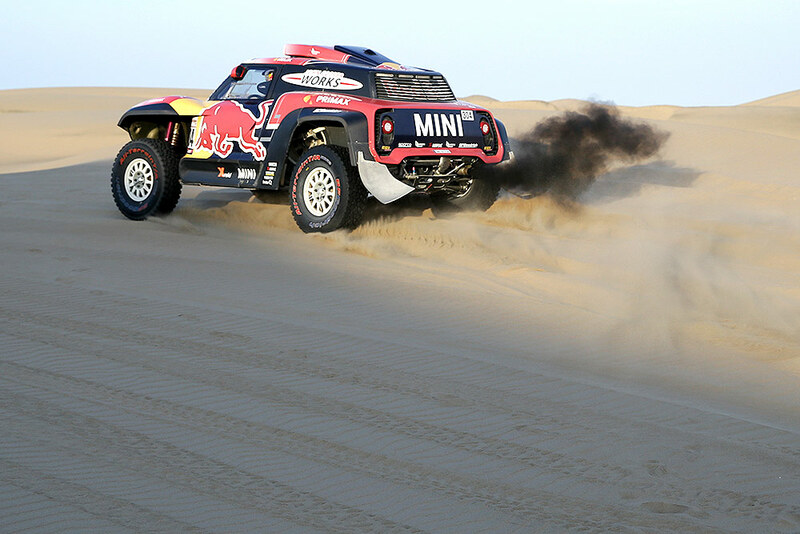 Driver Carlos Sainz, of Spain, and co-driver Lucas Cruz, of Spain, race their Mini during the first stage of the Dakar Rally between Lima and Pisco, Peru. 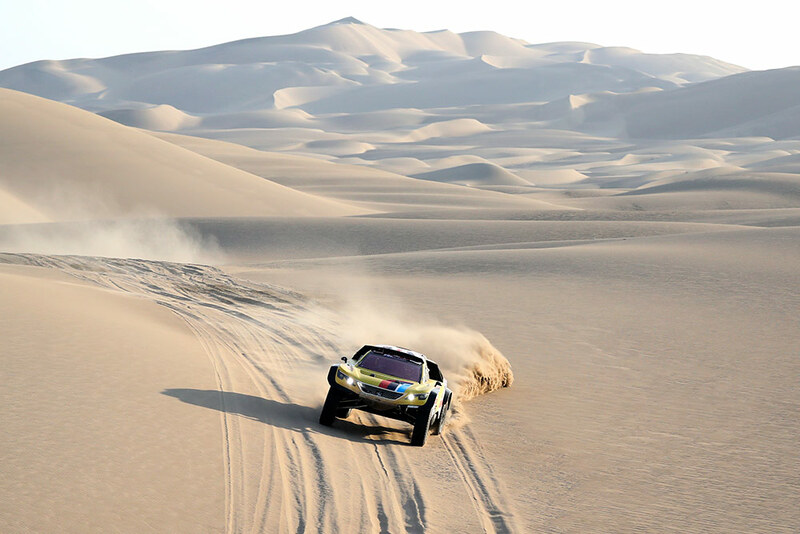 Driver Reinaldo Varela, of Brazil, and co-driver Gustavo Gugelmin, of Brazil, race their Can-Am during the first stage of the Dakar Rally between Lima and Pisco, Peru. 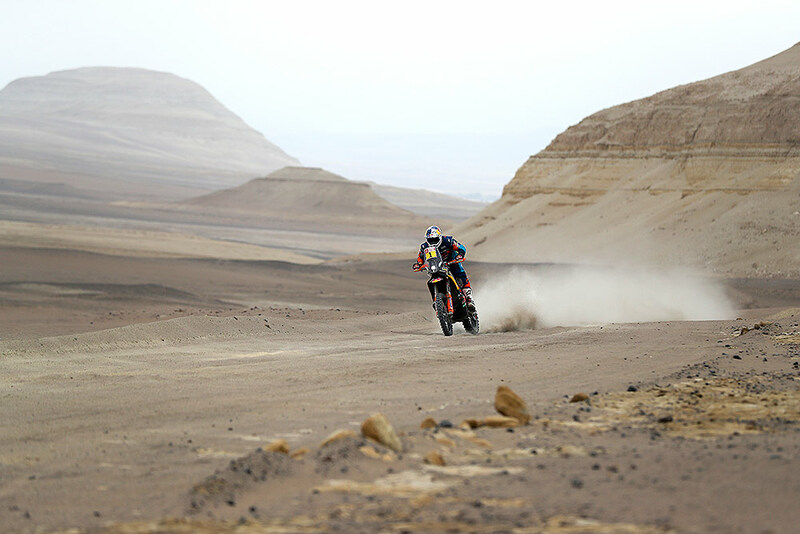 Matthias Walkner of Austria rides his KTM motorbike during the first stage of the Dakar Rally between Lima and Pisco, Peru. 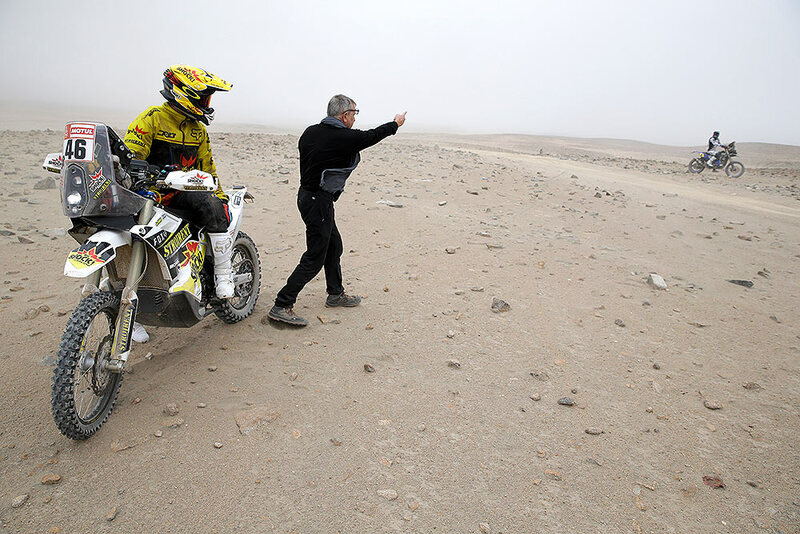 Armand Monleon of Spain, right, rides his KTM chased by Yamaha's rider Xavier De Soultrait of France during the first stage of the Dakar Rally between Lima and Pisco, Peru. 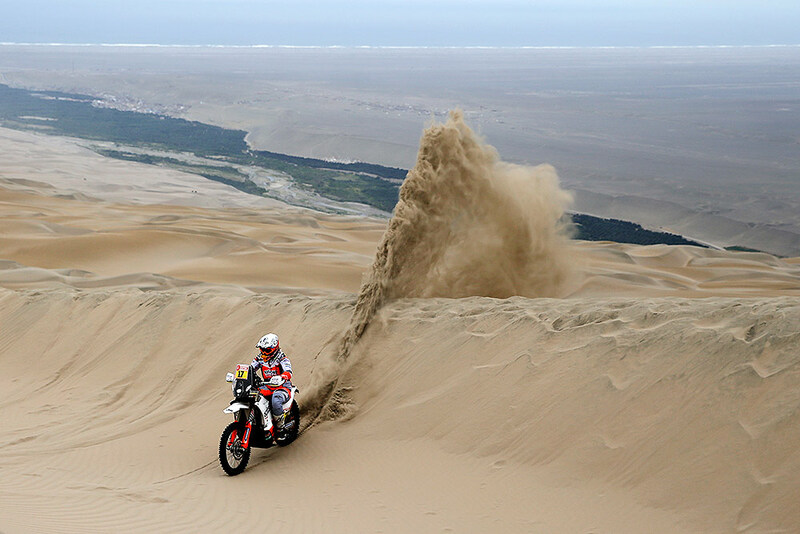 Paulo Gonçalves of Portugal rides his Honda motorbike during the first stage of the Dakar Rally between Lima and Pisco, Peru. 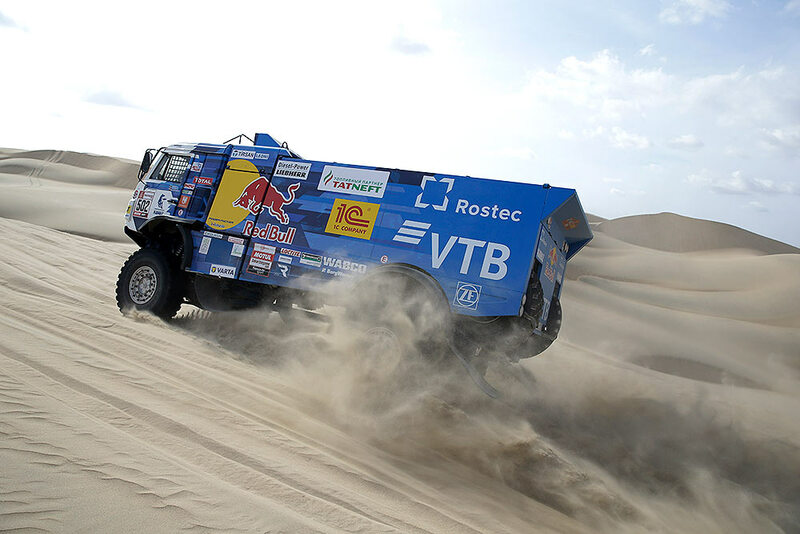 Driver Eduard Nikolaev and co-drivers Evgenii Iakovlev and Vladimir Rybakov, all of Russia, race their Kamaz truck during the first stage of the Dakar Rally between Lima and Pisco, Peru. 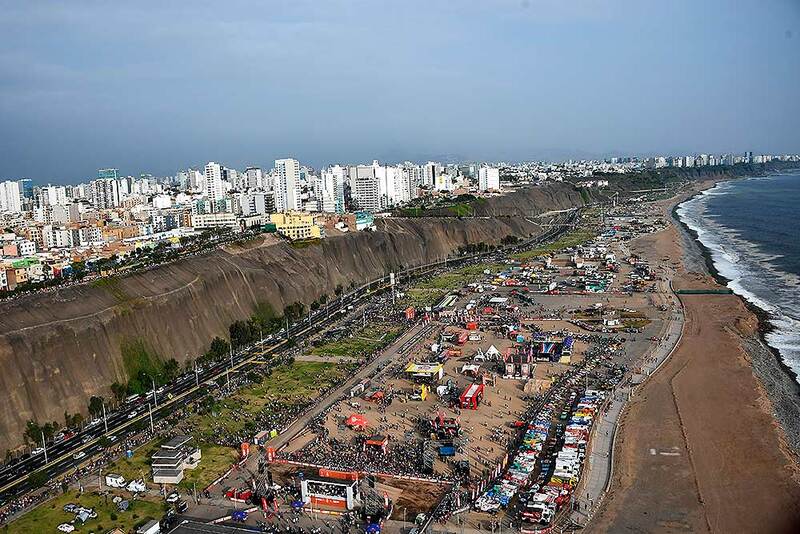 Spectators attend the podium ceremony before the start of the Dakar Rally in Lima, Peru. 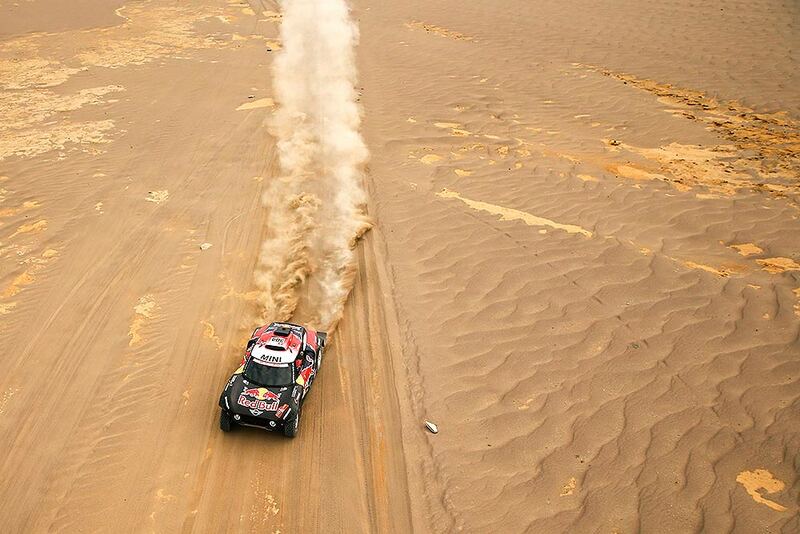 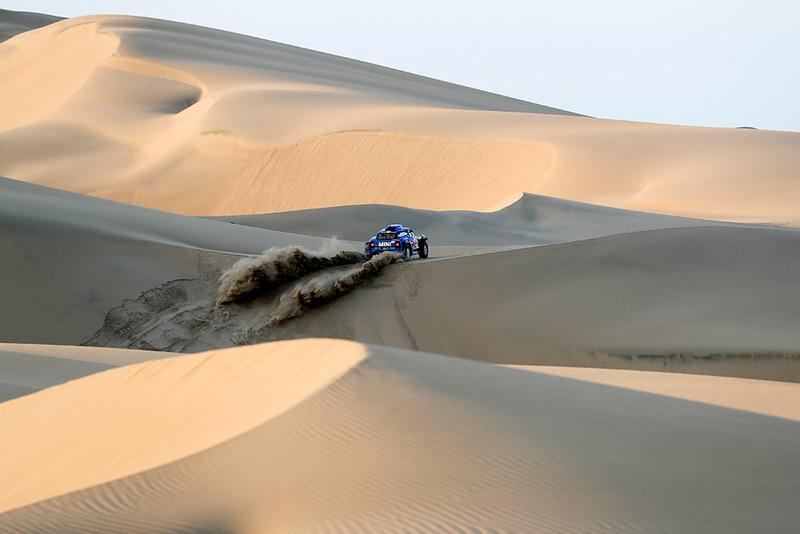 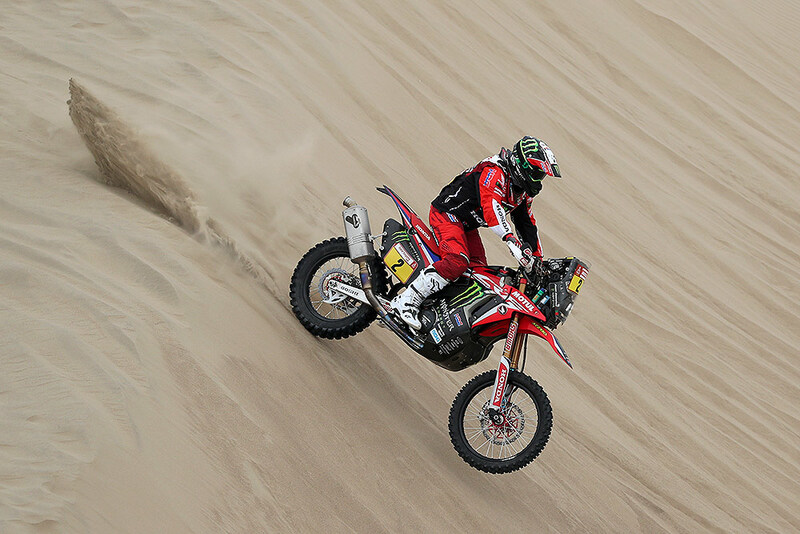 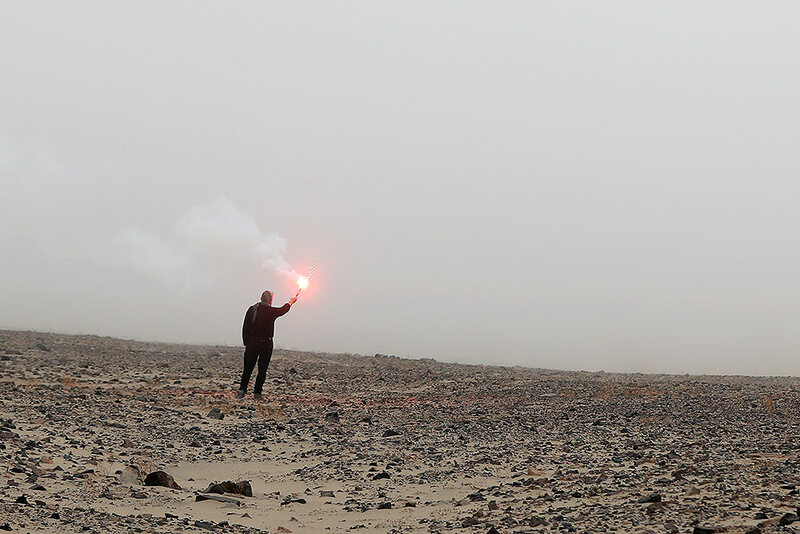 The 41st edition of Dakar Rally starts in Lima on Jan. 7, after symbolic start ceremony.